Protecting equipment, assets, goods, luggage and – ultimately- people in today’s spheres of transportation, commerce and storage is a continuing challenge. Attaching security labels to goods, vehicles, equipment and property can help organisations adhere to security legislation, track items and protect their investments. Security labels ensure speedier transit of goods and restrict theft and tampering, therefore saving businesses extensive amounts of both time and money. Take aircraft security seals as an example. These are applied to aircraft doors as the maintenance team and cleaners leave the plane, prior to the cabin crew re-entering it. Stuck to all entrances including cargo doors, maintenance and access doors they demonstrate a secure environment, showing that all items placed on the aircraft have been cleared and approved by relevant security staff. Each additional item, such as food carts and duty-free stocks are then further individually labelled using security stickers. With a clear visual indication of interference, action can be swiftly taken if a security seal has been breached. Bag seals and printed tapes customised with specific colours, logos and messages are also of benefit in documenting and tracking cargo and individual passenger baggage. This protection of luggage and goods in transit contributes to both safer travel and better passenger security management. Increased aviation security is now an inherent part of transportation within the global supply chain, and businesses, therefore, require corresponding high-quality labelling solutions. Asset labels, a necessity in today’s office and commercial environments, are perfect for labelling equipment in the workplace. Having a label that remains readable for the life of the item – whether that item is indoors or out, or exposed to unusual elements (i.e. temperature) – is crucial when it comes to inventories, stock management and asset identification. A company laptop, for example, may have several users throughout its lifespan – an asset label helps track this property. Using asset labels reduces the need to keep laborious manual records, minimising the likelihood of human error. 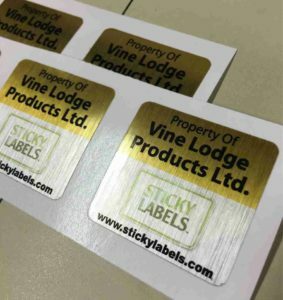 As well as items of value to every business, asset labels are of particular significance in industries where precise control is essential to comply with the regulations. For example, in the healthcare industry medication has to be carefully stored and accounted for. Asset labels are of benefit to many different types of organisation. Local Authorities have a schedule for maintaining and repairing its physical assets such as street lamps and signage. Asset labels help with this process by having information on each item that is immediately visible, such as the last repair. In the military, equipment and apparatus could require identification after exposure to hazardous conditions, and within heavy industry that is relying on 24-7 production, it is crucial that machinery is serviced and maintained in a timely manner. In warehouses and factories where efficiency in inventory control is the most important factor in keeping operations running smoothly, asset labels help eliminate excess stock, streamline deliveries and assist with ordering. The dictionary definition of “tamper” is “to meddle or interfere with; make unauthorised changes in”. This deliberate altering of products, packages or systems can wreak havoc for businesses, which makes tamper-proofing an essential part of logistic and storage processes. Tamper-proofing has been in evidence since ancient times when an unbroken wax seal would indicate that a letter hadn’t been opened in transit. A broken seal would not only show that a letter had been opened but would also act as an effective deterrent. 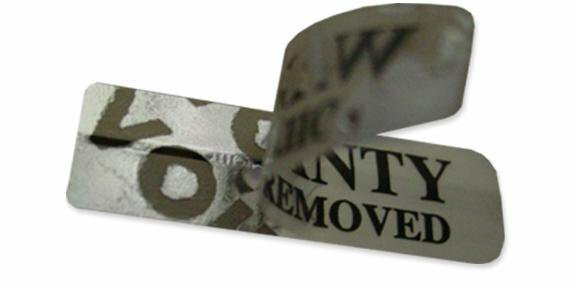 Today, tamper-evident labels may come in vinyl that cannot physically be removed in one piece; the fact that it breaks into pieces give an immediate indication that tampering has taken place or been attempted. Another method is to attach labels that leave the word “void” left behind on the asset, again offering a very visual means of evidence that tampering has occurred. Not only do these labels show tampering, they also have another use in terms of brand protection. Many gadgets and appliances offer warranties that protect consumers against the item’s breakdown or fault; both manufacturers and customers have a key interest in keeping this warranty protected. Tampering voids this warranty. By labelling the item it is clear to everyone who handles it that the warranty no longer applies once the package has been opened, offering protection to the item itself, the consumer and the manufacturing brand. Being able to customise these labels is important to companies, in terms of text, branding and material used to create them. 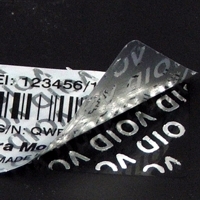 Sequential numbering is useful in tracking and some businesses like to include a barcode so that information is displayed in both a human and computer-readable way. The material used may be determined by use – is the asset indoor or outside, or travelling between the two? Flexography is a contemporary print method that allows for printing on a variety of packaging materials and backgrounds, allowing for further customisation.